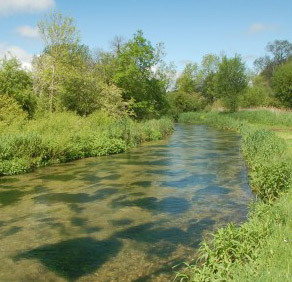 The River Lambourn is a Site of Special Scientific Interest (SSSI) and a Special Area of Conservation (SAC). It is a classic chalk stream, rising above the village of Lambourn and flowing south east, under the M4 by Welford and through Newbury before joining the river Kennet. The river is currently failing to meet ‘good ecological status’, largely as a result of habitat restoration like the example at Hunts Green pictured left. There are a number of habitat restoration projects, including a project at Welford, as well as measures to reduce the impact of farmland runoff.